Australians as always will make their own judgments about 1975 and hindsight, of course, offers 20/20 vision. For what it’s worth, I believed then, and I still do, that Sir John Kerr should have given Gough Whitlam notice of his intentions. His justification that if he had, which he gave to me some years later when I met with him, was that if he had done so he feared that Whitlam would sack him first, I don’t think is an adequate justification for that failure of notice. Nonetheless, it’s 40 years away, it’s history, and everyone’s entitled to a view. This book allows to us revisit those days of tumult, to look anew at the chronology and to refresh our understanding. For those familiar with the territory it’s a chance for reflection and reappraisal. For those who come fresh to the arguments and that may now extend to two generations of Australians, the past may well seem like a different country. But there is one enduring message of confidence arising from those days of uncertainty—Australia’s political institutions are able to recover and reset remarkably quickly and resiliently. 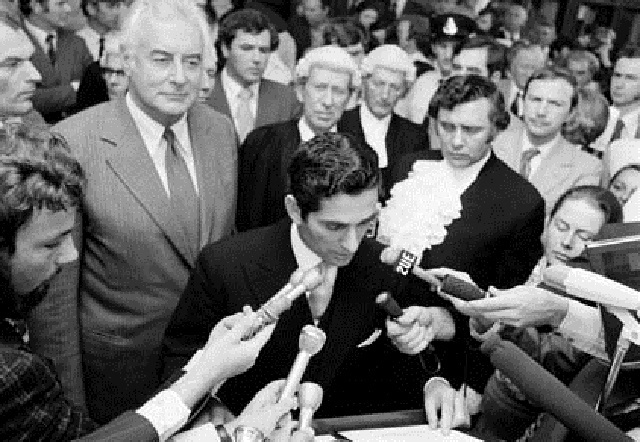 Consider it this way – for all of the passion and anger about John Kerr’s intervention, the next Labor leader after Gough Whitlam was appointed Governor-General by the next Labor PM, (Bob Hawke) after Gough Whitlam. Only ten years after the Whitlam’s retirement, Prime Minister Hawke offered his former leader Bill Hayden the appointment as Australia’s 21st Governor-General. Bill Hayden served for seven years in that role and both would attend John Kerr’s funeral in 1991. What should always be remembered and respected is that Australia survived this incendiary political crisis without civil unrest, much less violence. The basic fabric of national unity, the support for parliament and the law, remain strong. Ultimately, in 1975 the electorate, the people, had the opportunity to declare their verdict and they did so most emphatically in the best way we have for deciding such matters, through a free vote. Now, would they have decided differently if they’d known then what we know now? I’m not convinced of the usefulness of playing fantasy politics or, you know, retro history of retro historical analysis, but I’d say this: I think there’s a second lesson that comes out of those events of 1975. Ultimately the Australian people voted on the question of economic management. That’s what they voted on. They didn’t vote on the question of the vice regal crisis or the constitutional crisis. They voted to tip out the Whitlam Government because they felt they were mismanaging Australia’s economy. Bill Clinton might have put his finger on it himself with that great slogan, it’s the economy stupid. It was then and still is. This is an edited text of a speech given by the Prime Minister at Parliament House earlier today at the launch of The Dismissal by Paul Kelly and Troy Bramston. Image courtesy of National Archives of Australia A6180, 13/11/75/39.